All performances are open to the public at no charge. Parents and friends are encouraged to attend the festival. Your students are encouraged to listen to as many bands as possible. Parents and friends are advised to park in the large lot located on the east side of Gateway Boulevard (103 Street). There will be a fee for parking. All Concert Band performances will take place in the ATB Financial Arts Barn located at 10330 - 84th Avenue. All Jazz performances will take place in the Old Strathcona Performing Arts Centre (8426 Gateway Boulevard NW), half a block north of the Arts Barn. Because the stage will be set appropriately for the size of your band, it is essential that you fax this form to Al Stafford at (780) 451-5729 on or before March 1st, 2019. Please do your best to work within the set-up provided on stage. If you must change the configurations, it is your responsibility to make all adjustments AND change it back within your time allotment. PLEASE DO NOT REMOVE CHAIRS, STANDS OR EQUIPMENT FROM ANY STAGE. Please fill out the enclosed Emcee Form and turn it in at the registration desk when you arrive at the festival. Please type or print neatly, as the MC will introduce your group directly from this form. Ideas of what to include are age and/or grade of ensemble members, musical selections and the order they are being played in, or any special notes about the school or performing ensemble that you would like to have shared such as upcoming performances or planned camps or trips. This form is optional. This is an opportunity for you as the band director to share any pertinent information with the adjudicators about your band that would be beneficial for them to know about in order to make the festival experience more meaningful or appropriate for your ensemble members. If you decide to use this form, please attach a copy of it to the front cover of the score for your first piece to be performed (one for each adjudicator). Upon registration, you are required to submit two conductor's scores for each piece of music you perform. Please ensure of your ensemble is on the front of each score and that that measures of each score have been numbered so the adjudicators are able to make quick and easy reference to them. AIBF does not condone illegal copies of scores. If your scores have been ordered and delayed for any reason, please contact your music store representative for a letter to be included at registration to explain the situation. Each band will perform 2, 3 or 4 selections at the director's discretion, provided the time allotment is not exceeded. Please ensure to allow time for your ensemble to get on and off the stage and time in between pieces for adjudicators to finish their comments when you put your program together. The festival does not utilize a required or suggested repertoire list. Adjudicators may comment on the suitability and appropriateness of repertoire on the adjudication sheets. Grade 1 - 3 Concert Bands will have 30 minutes on the performance stage followed by a 30 minute clinic with one of the adjudicators in a different room. Grade 4 - 6 Concert Bands have been given 45 minute time slots on stage followed by a 45 minute clinic. this has been done to accommodate the increased set-up time for percussion that much of this repertoire demands. Jazz Ensembles will have 45 minutes on stage for their performance and clinic. The Alberta International Band Festival encourages you to select musical literature that you believe will best showcase your ensemble at the grade level you have registered them for. Unlike other music festivals, we don't have a set performance list. We recommend you play a minimum of two pieces, but many groups opt to perform a warm-up piece or march that you have the option of including as part of your adjudication or not. The pieces selected should be in contrasting styles. For example, a good concert band program might include a traditional march and then a more contemporary original concert band work. A jazz program might include a swing tune, a ballad, and a funk tune. Total stage time for Grade 1 to 3 Concert Bands is limited to a maximum of 30 minutes including set-up, performance, and departure. Total stage time for Grades 4 to 6 Concert Bands is limited to a maximum of 45 minutes to allow for additional set-up requirements; however, the actual performance time must not exceed 30 minutes. Talk to more experienced teachers in your community including other teachers within your own area. they are often more than willing to share ideas and experience. Talk to your music store representative. Both St. John's Music and Long & McQuade have music specialists who stay up to date on the new repertoire that is out there, as well as some of the tried and true "classics". they might have some great suggestions that would be ideal for your ensemble. The Alberta Band Association has put together a syllabus for their festival. You can find the one for 2017 and past years at ABA Syllabus. Teaching Through Performance books (available at most music stores). However, be aware that these are American books and the performance level they indicate a piece is at may not always be accurate. Pieces selected should be original works for concert band and/or jazz and. While there is a definitely place for pop music, movie music and Broadway musical selections in the musical world, they are often not the best choices for festival performance literature. A reminder that you are required to submit two conductor's scores for each piece you perform for adjudication (not including the one that you will be using yourself). AIBF does not condone the use of photocopied scores. Please order your scores early to avoid problems at Festival time. Please see the attached Equipment List to see a detailed listing of equipment that will be provided for you at the festival. Auxiliary percussion equipment, mallets, etc. will not be provided. Please note that equipment lists are organized by venue. It is your responsibility to read these lists carefully to provide any other equipment necessary for your performance. PLEASE ENSURE THAT ALL EQUIPMENT PROVIDED BY THE FESTIVAL REMAINS IN EACH VENUE. If there is a problem with any of the festival equipment, please advice a festival representative right away so we can get the problem rectified as quickly as possible. Numerous restaurants can be found within walking distance of the venues. Both of the venues are located in the heart of "Old Strathcona". The festival location is two blocks north of Whyte Avenue (82nd Avenue) and all of its eclectic stores and restaurants. 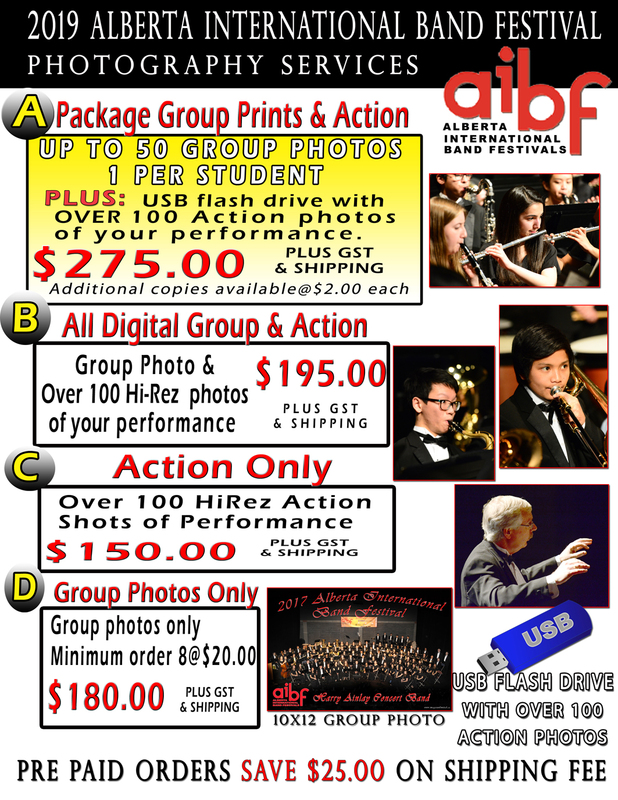 The Alberta International Band Festival - North will have the services of a professional photographer available to bands. Please contact IMAGES UNLIMITED directly at [email protected] or phone 403-253-0200. We hope that all Band Directors will be able to attend the Director's Reception at 8:30 PM on Wednesday, March 13th in the ATB Financial Arts Barn. The reception will follow the AIBF Feature Concert. Directors, sponsors, adjudicators and dignitaries are invited to attend. The 2019 Feature Concert at 7:00 PM on Wednesday, March 13th will showcase the EDMONTON WINDS and the RIVER CITY BIG BAND. Tickets for the concert should be pre-ordered as they are on a limited "first come, first served" basis. Any remaining tickets will be available at the door. Each Band Director will be provided with a complimentary ticket, however, they too should be pre-ordered. The Radisson Hotel & Convention Centre is offering a special AIBF rate of $129 in the Main Tower or $139 in the West Tower plus taxes. Special breakfast offering is also made. Adjudication forms and awards will be sent out at the conclusion of the festival. Band directors should make sure that they have their extra copies of scores with them at the conclusion of their clinic. All bands will be adjudicated against a standard of performance as established by rubrics set by the AIBF committee. Bands receive "SUPERIOR", "EXCELLENT" or "GOOD" ratings from each of two adjudicators. One adjudicator gives a written evaluation, while the other provides recorded comments of the performance. Bands that receive a "SUPERIOR" rating from both adjudicators will receive a "Gold Award" plaque.